Happy Monday! Hope you guys had a great weekend. Ours was SUPER COLD! It snowed almost 5 inches on Saturday which is really odd for this time of year. Typically the DC-metro gets most snow in January/February and December is pretty mild. It's making me worried for what is to come! My cousin did still stay with us and we had a blast Christmas shopping, watching Christmas movies, etc. I honestly don't know if I've loved any blog look as much as I love this one. Something about the big oversized sweater, the red lip and the mom jeans! I feel like this is my favorite kind of style and a look that I just totally gravitate towards. It's effortless but I think adding a pointy-toe bootie and a red lip makes it look like you put in way more effort than you did! Y'all definitely need these jeans too. If you're looking to get on the mom jean trend these are a great price and a great fit! You look awesome!! I love a good oversized sweater; this one is perfect! Love this to pieces, so tre chic!!! You look like you should be strolling the streets of Paris! This boots are so fabulous! Have a great start to your week! Your sweater looks soooo comfy! Ok, can I just come steal this outfit out of your closet? I love that sweater! So chic babe! The hat, the sweater and those booties- I love this entire look! YAY for big oversized sweaters! We are so twinning on our blogs! Love this knit and how cozy it looks on you too. That pop of red was the PERFECT choice to fish off this super cute look! It's so weird that is snowed in December! We got so much, it's been crazy! Love this cozy sweater, it's perfect with the pop of red! This sweater looks so cozy! I have a similar one from Nordstrom last year and I love pairing it with red. You look so cute! How crazy was that snow?! We never get snow this early! Happy Monday, Kelly! That outfit is so cute. I love the striped sweater. Love this cool edgy look! 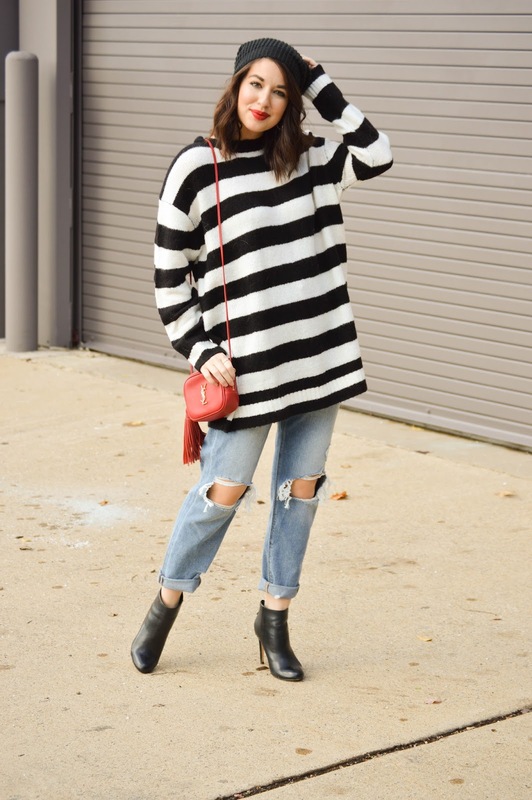 The oversized sweater is amazing and I love the pop of red! Such a cute winter look- I love the edge the oversized pieces bring this outfit! Worrrrrrk! SO pretty! this sweater is cozy and fabulous, and I love your pop of red! I love an oversized cozy look too. That snow was crazy! I'm in VA, so I know what you mean, I'm a little worried about what's to come now! Absolutely love your sweater! You look amazing! I love nice, big sweaters like that for the winter. I really should look into a striped one. I love how you styled it with jeans and heels. I love this adorable, casual, put-together Autumn/Winter look. That beanie is so cute on you. Love the pop of red and the oversized stripes, too. Welcome by Thursdays to link your fabulous style with me. I also think you'd like my last two style posts. Happy Hump Day!! Babe, you efforlessly make basic outfits look so pretty! You always look so sweet. Love it! Rosy Outlook is a part of several affiliate advertising programs. This means that if you click and/or make a purchase through certain links on this site or any other related social media platforms, I may make a commission from it. I will always disclose gifted items with c/o and will disclose if a post is sponsored. With that being said, I will always give an unbiased, fair assessment and review of everything presented on this site.